Rhynia is a single-species genus of Devonian vascular plants. Rhynia gwynne-vaughanii was the sporophyte generation of a vascular, axial, free-sporing diplohaplontic embryophytic land plant of the Lower Devonian that had anatomical features more advanced than those of the bryophytes. Rhynia gwynne-vaughanii was a member of a sister group to all other eutracheophytes, including modern vascular plants. Rhynia gwynne-vaughanii was first described as a new species by Robert Kidston and William H. Lang in 1917. The species is known only from the Rhynie chert in Aberdeenshire, Scotland, where it grew in the vicinity of a silica-rich hot spring. 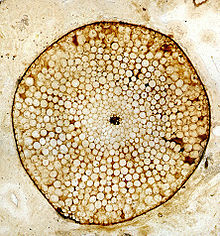 Rhynia was a vascular plant, and grew in association with other vascular plants such as Asteroxylon mackei, a probable ancestor of modern clubmosses (Lycopsida), and with pre-vascular plants such as Aglaophyton major, which is interpreted as basal to true vascular plants. Rhynia is thought to have had deciduous lateral branches, which it used to disperse laterally over the substrate and stands of the plant may therefore have been clonal populations. Evidence of the gametophyte generation of Rhynia has been described in the form of crowded tufts of diminutive stems only a few mm in height, with the form genus name Remyophyton delicatum. Like those of Aglaophyton major, Horneophyton lignieri and Nothia aphylla the gametophytes of Rhynia are dioicous, bearing male and female gametangia (antheridia and archegonia) on different axes. A significant finding is that the axes were vascular, unlike almost all of the gametophytes of modern pteridophytes except for that of Psilotum. Two species of Rhynia were initially described by R. Kidston and W. H. Lang from the Rhynie chert bed: R. gwynne-vaughnii in 1917, and R. major in 1920. R. gwynne-vaughanii was named by Kidston and Lang in honour of their former colleague, the botanist Helen Gwynne-Vaughan. A study of the vascular tissue of the two by David S. Edwards in 1986 lead to the conclusion that the cell structure of R. major lacked secondary thickening bars seen in the xylem of R. gwynne-vaughanii, and was more like the water-conducting system (hydrome) of moss sporophytes. His conclusion was that R. gwynne-vaughanii belongs in the vascular plants, while R. major belongs among the bryophytes. Accordingly, he transferred it to a new genus as Aglaophyton, leaving R. gwynne-vaughnii as the only species of Rhynia. Rhynia is the type genus for the rhyniophytes, established as the subdivision Rhyniophytina by Banks, but since treated at various ranks. In 2004, Crane et al. published a cladogram for the polysporangiophytes, in which Rynia and the other Rhyniaceae are placed as basal vascular plants (tracheophyes). ^ Kenrick, P.; Crane, P.R. (1997). The origin and early diversification of land plants : a cladistic study. Washington & London: Smithsonian Institution Press. ISBN 978-1-56098-729-1. Fig. 4.8, p. 101. ^ Edwards, D.S. (1980). "Evidence for the sporophytic status of the Lower Devonian plant Rhynia gwynne-vaughanii Kidston and Lang". Review of Palaeobotany and Palynology. 29: 177–188. doi:10.1016/0034-6667(80)90057-3. ^ a b Kidston, R.; Lang, W.H. (1917). "On Old Red Sandstone plants showing structure from the Rhynie chert bed, Aberdeenshire. Part I. Rhynia gwynne-vaughanii, Kidston and Lang". Transactions of the Royal Society of Edinburgh. 5: 761–784. doi:10.1017/s0080456800008991. ^ Edwards, D.S. (1986). "Aglaophyton major, a non-vascular land-plant from the Devonian Rhynie chert". Botanical Journal of the Linnean Society. 93 (2): 173–204. doi:10.1111/j.1095-8339.1986.tb01020.x. ^ Bateman, R.M. ; Crane, P.R. ; Dimichele, W.A. ; Kenrick, P.R. ; Rowe, N.P. ; Speck, T.; Stein, W.E. (1998). "Early Evolution of Land Plants: Phylogeny, Physiology, and Ecology of the Primary Terrestrial Radiation". Annual Review of Ecology and Systematics. 29 (1): 263–292. doi:10.1146/annurev.ecolsys.29.1.263. ^ Edwards, D.S. (1980). "Evidence for the sporophyte status of the Lower Devonian plant Rhynia gwynne-vaughnii Kidston and Lang". Review of Palaeobotany and Palynology. 29: 177–188. doi:10.1016/0034-6667(80)90057-3. ^ Remy, W.; Hass, H. (1996). "New information on gametophytes and sporophytes of Aglaophyton major and inferences about possible environmental adaptations". Review of Palaeobotany and Palynology. 90: 175–193. doi:10.1016/0034-6667(95)00082-8. ^ Remy, W.; Remy, R (1980). "Lyonophyton rhyniensis n. gen. et nov. spec., ein Gametophyt aus dem Chert von Rhynie (Unterdevon,Schottland)". Argumenta Palaeobotanica. 6: 37–72. ^ Remy, W.; Hass, H. (1991a). "Langiophyton mackiei nov. gen., nov. spec., ein Gametophyt mit Archegoniophoren aus dem Chert von Rhynie (Unterdevon Schottland)". Argumenta Palaeobotanica. 8: 69–117. ^ Remy, W.; Hass, H. (1991b). "Kidstonophyton discoides nov. gen. nov. spec., ein Gametophyt aus dem Chert von Rhynie (Unterdevon, Schottland". Argumenta Palaeobotanica. 8: 29–45. ^ Holloway, J.E. (1939). "The gametophyte, embryo and young rhizome of Psilotum triquetrum Schwarz". Annals of Botany. 3: 313–336. ^ Kidston, R.; Lang, W.H. (1920). "On Old Red Sandstone plants showing structure, from the Rhynie Chert Bed, Aberdeenshire. Part II. Additional notes on Rhynia gwynne-vaughani, Kidston and Lang; with descriptions of Rhynia major, n.sp. and Hornea lignieri, n.g., n.sp". Transactions of the Royal Society of Edinburgh. 52: 603–627. doi:10.1017/s0080456800004488. ^ "Rhynia". Rhynie Chert News. Retrieved 9 April 2014. ^ Edwards, David S. (1986). "Aglaophyton major, a non-vascular land-plant from the Devonian Rhynie Chert". Botanical Journal of the Linnean Society. 93 (2): 173–204. doi:10.1111/j.1095-8339.1986.tb01020.x. ^ Banks, H.P. (1975). "Reclassification of Psilophyta". Taxon. 24 (4): 401–413. doi:10.2307/1219491. , cited in Banks, H.P. (1980). "The role of Psilophyton in the evolution of vascular plants". Review of Palaeobotany and Palynology. 29: 165–176. doi:10.1016/0034-6667(80)90056-1. ^ Crane, P.R. ; Herendeen, P. & Friis, E.M. (2004). "Fossils and plant phylogeny". American Journal of Botany. 91 (10): 1683–99. doi:10.3732/ajb.91.10.1683. PMID 21652317. Retrieved 2011-01-27. This page was last edited on 10 April 2018, at 20:35 (UTC).